Hotel President, Marsala. President Hotel Marsala. 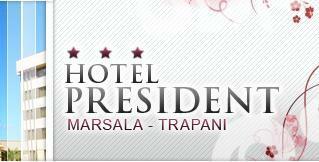 The President Hotel is placed in the superb city of Marsala, on the Western coast of Sicily. Thanks to its strategic position, you can easily reach the main sights in the closeness, such as Segesta, Erice, Selinunte, Egadi Islands and Pantelleria. It is a facility with a modern and functional design, equipped with air-conditioned 128 rooms with exclusive amenities, such as telephone, frigobar and colour TV. Other hotel services include banquet rooms, meeting rooms, private parking, indoor garage, car rent and a good restaurant serving international and typical Sicilian cuisine. The hotel is ideal for relaxing holidays or business journeys and provides its guests with a piano bar and an American bar, perfect spots for getting relaxed. In the reception you can book a cosy shuttle bus from/to Trapani airport, just 15 kms away, ask for information about main sights in Marsala, like the archaeological museum, the Roman spa building, tapestry museum, the Moiza island and cellar of famous Marsala wine.